I love textiles, old, new, bold and mellow. It is not hard to understand that the quilt industry and quilters are near and dear to my heart. These people love fabrics- and have stashes that rival my own! What an inspiring and creative group of women! 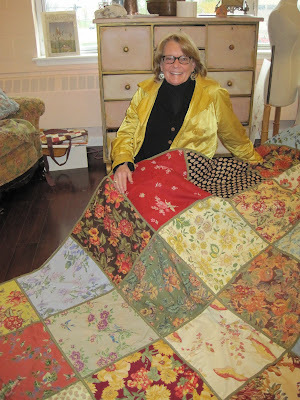 Recently…Amy White stopped by our office in Vermont and showed me her beautiful quilt. She made this quilt from an assortment of April Cornell fabrics. She also made fun pet collars, and collage fabric pictures. Do you have quilting projects that you would like to share? Giveaway: We will offer a jelly roll to a randomly selected winner who shares a project, favorite tips or fun ideas. By the way we have an interview coming up with Quilters Home Magazine (http://www.quiltershomemag.com/index.html) in the spring to be written by Melissa Maher. Be sure and stay tuned, or pick up a copy! UPDATE: We have a winner! Congratulations to Carol Sanzone, who posted below about her daughters and their quilts from their Grandmother. Best of luck on your quilting endeavors! My Idea: I'd like to take some of my daughters pretty out-grown things -that I haven't passed on- because they were "too loved and worn" or had baby dribble stains that couldn't be removed...but yet the fabric in other areas is so delicious to the eyes. It would make a beautiful keepsake for me as she gracefully grows thru the years. Then it would be my well deserved Mommy quilt! i have not made a quilt yet. i do aspire! i have been saving my childrens old clothing that have memories attached for quilts for each of them. all the beautiful fabrics and quilts out there are so inspirational! I am new to quilting. 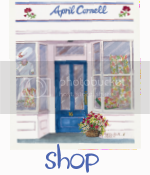 I have fallen in love with April Cornell fabrics due to the dresses my daughters wear. And I have fallen for the art of quilting due to my Mother-in-law's creations: she made a 'fish' quilt for our first daughter - all these layered fish. Its amazing. My second daughter, Molly (her 2 yr old sister just called her 'dolly' for a while) has a dolly quilt - they look like Holly Hobby profiles. She had to do something to the back - I think the fabric wasn't wide enough, so she had to 'work on it' - so she took pieces of the fabric from the front, and crafted my daughter's name on her quilt. I want to learn to quilt - I love that they have something made by their grandmother. When the girls would be sad, or sick, or just missing her, I wrap them up in the little quilt and tell them they are getting a "hug" from her. Thanks for the shout-out, April! Hope you are doing well and Happy Holidays!!! I am pretty new to quilting. I had made a few before this year, but when one of my husband's patients gave us a beautiful hand-quilted quilt for my new daughter, a new hobby for me was born. While I love perusing quilt patterns in magazines and on websites and in books, I am determined to not go too fast and end up frustrated. I am enjoying the ride. I was pretty proud of myself for using graph paper to sketch a design to use the 200 extra 3" blocks I had leftover from another project, which was in itself using leftovers from another project! I love digging in my stash and finding something useful to do with that fabric, in these tough economic times it makes me feel like I am being resourceful. So I definitely love the idea of having more variety in my stash! Thanks for the great giveaway. It's on my to do list! That and an apron & fabric flower brooches, which are fast and easy and make a great statement!!! I am also pretty new to quilting. For the last 20 years I have been raising 6 children. Just 2 yeasr ago with my last child starting to school full time have I been able to take time out for myself and quilt and really let my ideas soar. I recently found about 20 blocks with scotty dogs embrodered on them. They were made in the 40"s or 50"s by my Grandmother. If I can make them into a quilt for my children this winter it will be a keepsake they will cherish forever. If you have lots of scraps that you keep, trim them and sort by size and color. Sew some together when you are piecing blocks and in a little while you will have strips to sew together. I stick to a single color family with a few contrasting pieces mixed in. Then use as you would a piece of fabric. What beautiful quilts! I love your fabric designs. I love quilting too, when I get a chance, which hasn't been as much as I'd like lately. I've got some of my quilting projects on my blog. 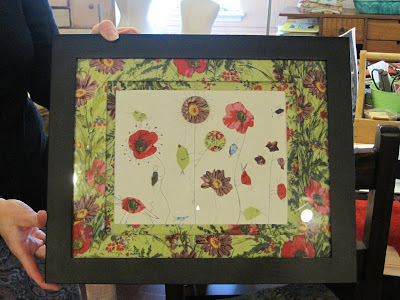 This post shows a set of mini original art quilts I designed and made from batik scraps, with some pen and ink drawing added, along with photos and some construction tips: http://elizabethruffing.com/2007/07/mini-art-quilts.html Thanks for sharing these! One of my favorite tips is to save the lovely selvages from fabrics like yours...they can be used for all sorts of projects. Thanks for the chance! My favorite help in my sewing room is the $8. roll of rubber shelf lining from Walmart. Yup! It has endless uses. I use it under mats and table covers so they don't slip, I use them as a table cover when I'm sewing to put tools and fabric pieces on, Slipper bottoms, I could go on but you get the idea. BTW, I love your fabric lines and I have an older book (2003) April Cornell at Home. I think I saw something about a new edition coming out! Hope I'm right. Thanks for the wonderful blog.